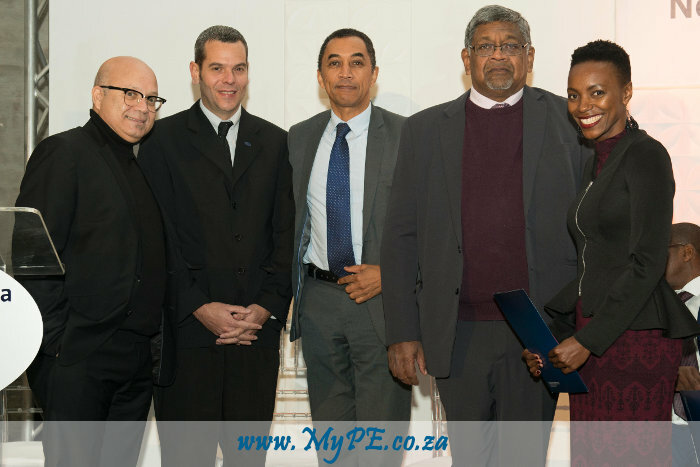 Dr Ismail Lagardien – Executive Dean: Faculty of Business and Economic Sciences, Mr Neil Stander – Ford Motor Company of Southern Africa, Prof Derrick Swartz – NMMU Vice-Chancellor, Judge Ronnie Pillay – Chairperson of NMMU Council and Ms Yonela Dube – recipient of Ford Premier Award. The Ford Motor Company of Southern Africa (FMCSA) continues to honour top achievers at the Nelson Mandela University (NMU) by sponsoring the annual Ford Premier Award, as it has done since 2001. Master’s Degree graduate Yonela Dube (30) was presented with the Ford Premier Award at the university’s academic awards for 2016, held at The Tramways Building in Port Elizabeth on Thursday 22 June, 2017. For her Master of Technology: Human Resources Management dissertation, Dube studied the influence that authentic leadership has on the engagement levels of employees. “I would like to thank Ford for sponsoring the award and the NMU for the recognition,” Dube said. “I must also thank my promoter, Dr Amanda Werner, for her expertise and continuous support. I am thankful for the wonderful support received from my family, friends and work colleagues. Her research included literature studies that highlighted the characteristics and behaviours of authentic leadership, and on employee engagement. For the empirical study, an electronic questionnaire was administered to managers and their direct subordinates in a manufacturing company, focusing on two divisions, namely, marketing/sales and manufacturing. “Authenticity is a leadership characteristic of exceptional leaders and it is an essential requirement for future leaders in an era when the motives and behaviours of many leaders are questionable,” she explained. According to Dube, the results from the study revealed that the managers displayed the characteristics and behaviours of authentic leaders and that the employees were engaged. The results also revealed that the employees believed that managers did not request feedback of their behaviour and the managers believed that the employees indicated lack of knowledge on their roles, lack of passion and energy. Other findings showed that self-awareness in a leader is an important predictor of engagement. The study concluded with several recommendations such as the use of the 360° feedback for employees to give feedback to managers regarding their behaviour; using the GIVE (Goals, Interests, Values and Emotions) Model to facilitate self-awareness for the managers and lastly applying an appreciative inquiry in the organisation for the development of genuine relationships, in order to encourage employee engagement. While Dube originates from Kokstad in KwaZulu-Natal, she is continuing her journey with NMU and is working as an Associate lecturer at the School for Industrial Psychology and Human Resources.